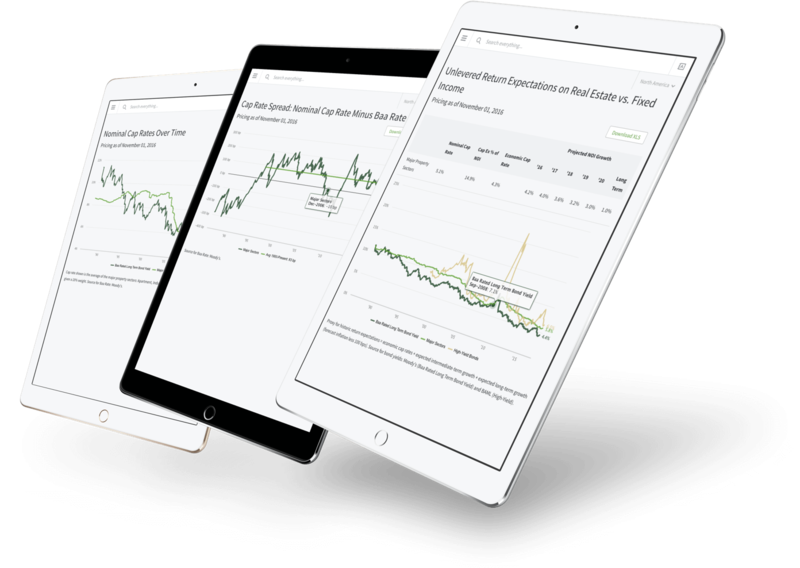 Green Street Advisors is widely recognized as the premier provider of research on Real Estate Investment Trusts (REITs), driven by our independent perspective, trusted proprietary data and actionable insight. We help our clients gain a thorough understanding of the entire REIT ecosystem at the macro, sector, REIT and property level to drive more informed investments. Green Street Advisors’ analysis of listed real estate begins with a deep understanding of the value of underlying properties owned by the REITs. Our analysts visit hundreds of properties each year and tap into their deep network of Pan-European REIT market contacts to inform their valuation models. Our trusted spot NAVs are the backbone of the valuation model that we have used for over twenty years. 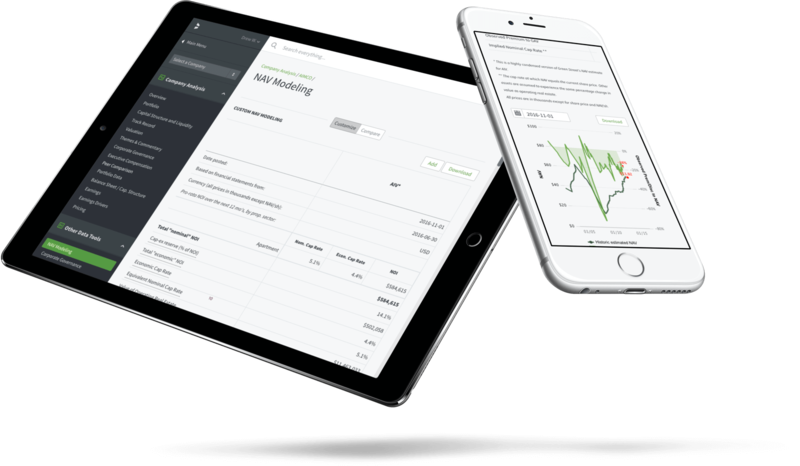 We publish over 800 reports and Quick Takes annually and have over 11,000 reports in our library to explain, forecast and influence the public markets. Our deep team of experts exclusively focused on real estate produces REIT research read by the leading investment managers of the REIT world. In independent surveys, clients voted Green Street #1 for most trusted, best original research, and best stock recommendations. Green Street Advisors has grown to become a leading provider of research on the listed and direct real estate markets in the UK and Europe. Our Pan-European REIT research offering includes big-cap REITs, large core sectors, as well as niche sectors, representing underlying properties with a gross asset value of over £300 billion. A globally consistent approach and close collaboration between our North American and Pan-European teams results in unique, cross-border insights. Monthly report providing a macro view of REIT and real estate valuation. Report identifying near-term mispricing of REITs. Guide for finding trading opportunities based on relative share price movement. Flagship report by Mike Kirby, Green Street’s co-founder, exploring critical aspects of public and private market real estate. Time series of unleveraged U.S. commercial property values. Reflects the prices at which commercial real estate transactions are currently being negotiated. A synthesis of the key trends for real estate, covering supply and demand, property fundamentals, valuation and the relative attractiveness of sectors. Thought leadership on important industry topics, including capital structure, corporate governance, leverage, and capital expenditures that shape the REIT market. Detailed analysis and forecasting of market fundamentals, including supply and demand, capital allocation, and valuation for every major sector. In-depth analysis and valuation of 120+ REITs and real estate companies, grounded in fundamentals and a thorough awareness of portfolios. Independent analyst reaction to key REIT news developments. Timely insights on market fundamentals, transactions, and valuation. Two-page analysis with investment conclusions updated daily. Includes key valuation metrics, NAVs, investment theses, recent news, and portfolio statistics. Go-to report providing Green Street’s spot NAVs, earnings estimates, and investment recommendations for 46 listed real estate companies. Semi-annual report highlighting the most important drivers impacting property fundamentals and valuations across sectors and countries in the Pan-European sphere. Flagship report by Mike Kirby, Green Street’s co-founder, exploring critical aspects of public- and private-market real estate. Monthly scorecard comparing the relative attractiveness of 21 property sectors in Europe, the UK and the U.S.
Guide to help investors capitalise on the noise of the Pan-European listed market by identifying near-term price inefficiencies. 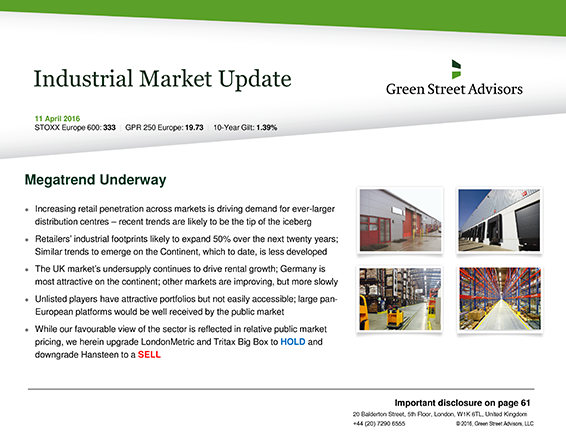 Substantial biannual updates on key property sectors, including key drivers, forecasts, and cross-market views. Timely and detailed commentary on critical factors impacting real estate. Deep research and analysis on over 42 European property companies covering over 90% of the Pan-European Index (GPR 250) by market cap. Brief notes providing timely commentary on company announcements and industry news. 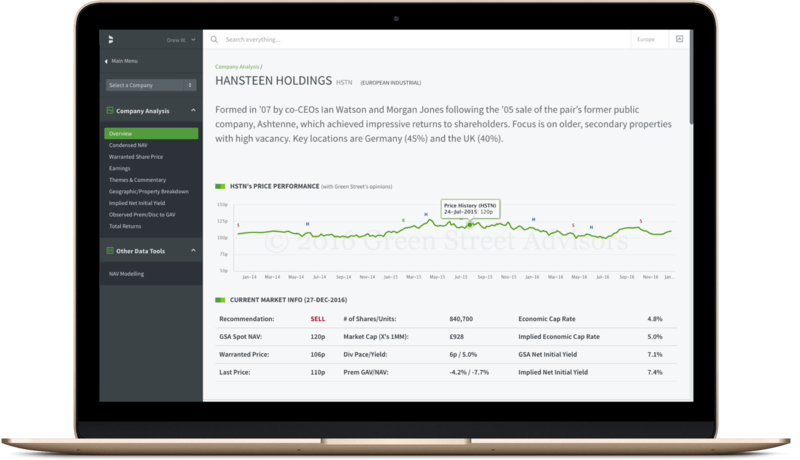 Green Street DataTools feature our extensive historical data including cap rates, return expectations, valuation estimates, and key company information not available elsewhere. 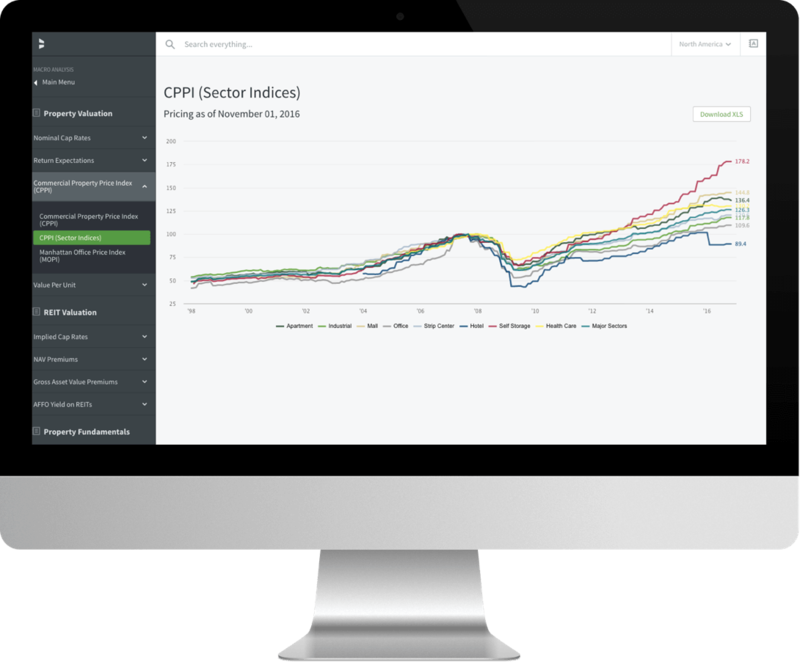 Green Street DataTools include our net initial yields, return expectations, spot Net Asset Value (NAV) models and a vast compendium of other data for measuring property, portfolio and company performance across the UK and Europe. 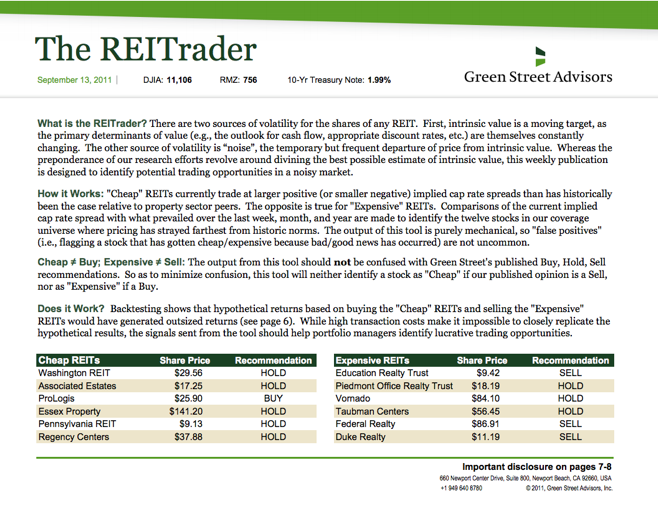 Individual company landing pages provide the most important components of Green Street’s real estate investment trust (REIT) valuation model. 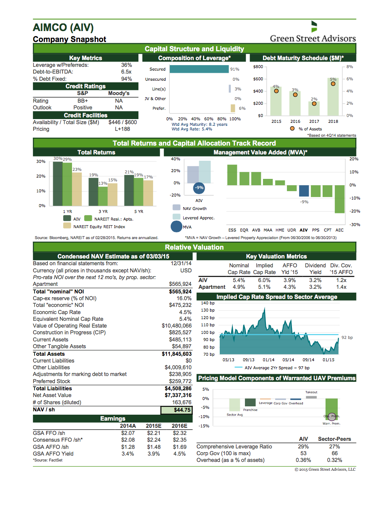 Access two-page company snapshots summarizing Green Street’s core conclusions and analytics for each company under coverage. 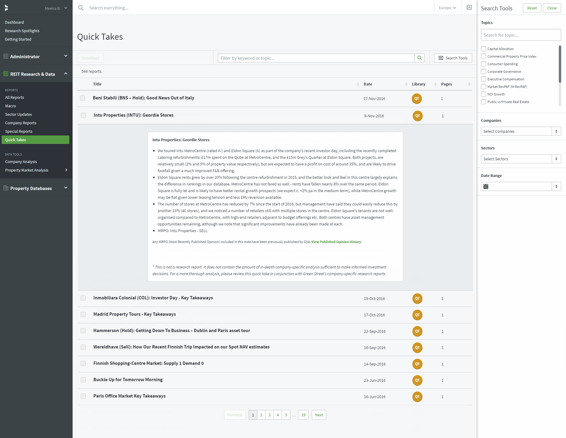 Includes key investment themes and portfolio analytics, relative valuation and a condensed Net Asset Value (NAV) model, capital structure and liquidity summaries, and total returns and capital allocation track records. 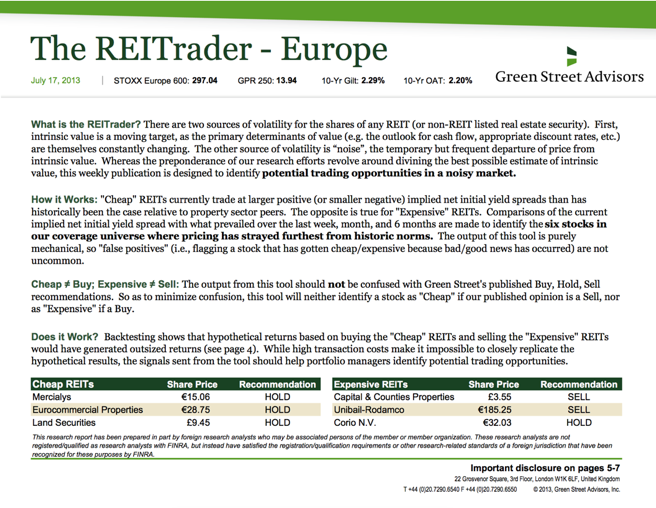 REIT Market Analysis offers Green Street’s data, built from 20+ years of proprietary analysis. The time series data includes key valuation metrics such as implied cap rates, adjusted funds from operations (AFFO) yield on REITs, NAV premiums, unleveraged asset value premiums, net operating income (NOI) growth, occupancy, REIT value per unit and implied value per unit. This powerful tool helps investors assess the fair value of REITs vs. other benchmarks and determine the relative attractiveness of sectors. Green Street’s mall database provides an interactive collection of information and insights for over 1,300 regional malls and other retail properties across the U.S. 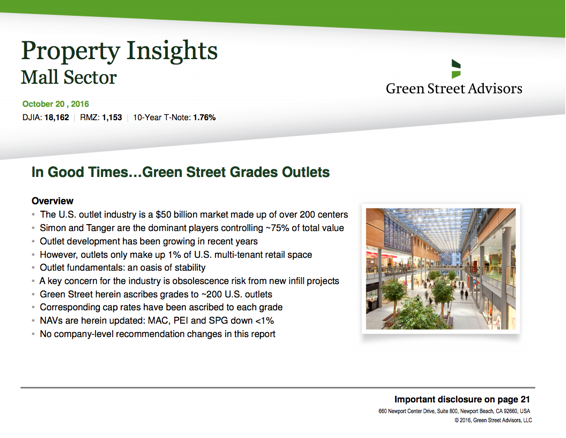 The database offers Green Street’s proprietary data on cap rates and quality grades per mall using sales per square feet. It can be used to generate customized reports by owner, metropolitan area, or retail property type, provide property snapshots; and create tailored maps. The Net Asset Value (NAV) modeling tool provides an in-depth look at the components of our NAV estimate for each REIT—the first building block in Green Street’s core valuation model. Investors can incorporate their own assumptions and test sensitivity to the assumptions employed by our analysts. Property Market Valuation offers Green Street’s proprietary valuation estimates for 13 different property sectors, drawing on 20+ years of Green Street insights. 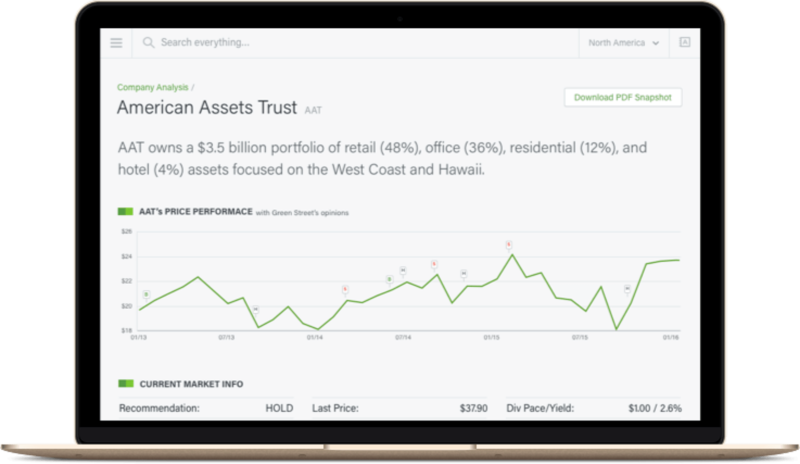 This tool uses interactive, downloadable graphs and data for analyzing the real estate value in the private and public markets. 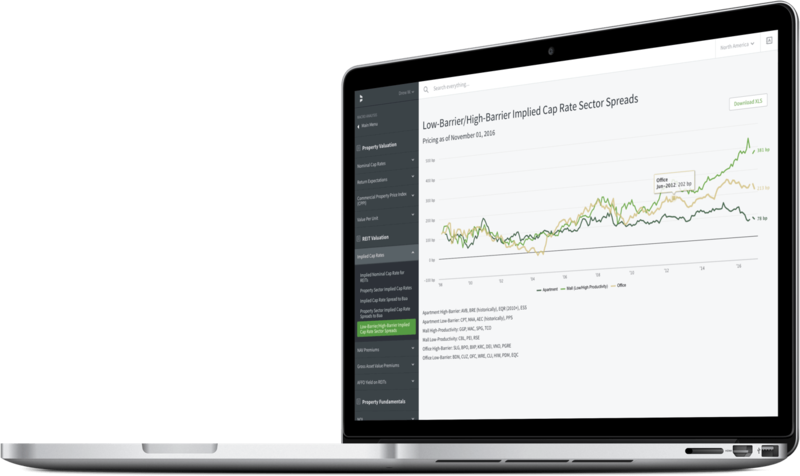 It provides investors with a meaningful understanding of cap rates, return expectations and spreads across property sectors. 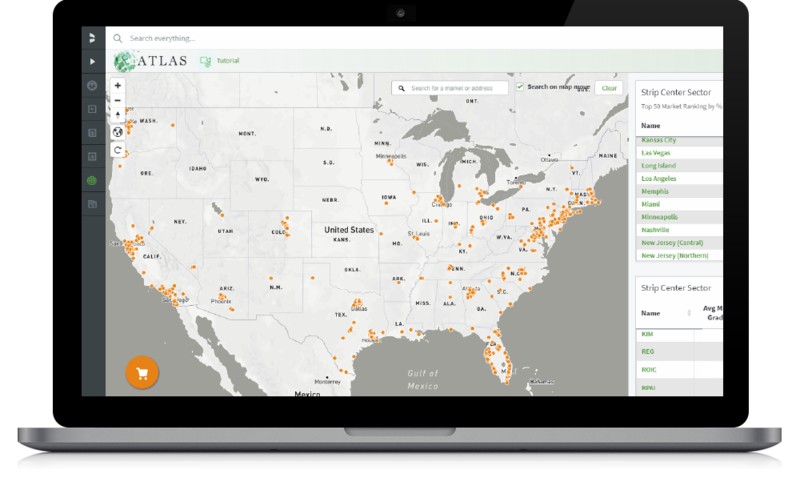 Green Street’s Strip Center Database provides detailed and proprietary data and analysis for over 2,500 REIT-owned strip center properties across the U.S. The database offers key metrics for determining strip center quality such as average base rent, surrounding demographics, and occupancy. New Trade Area Power ("TAP") Scores measure trade area strength with one metric that can be compared across properties and markets. It includes extensive tenant lists and proprietary cap rates by market. 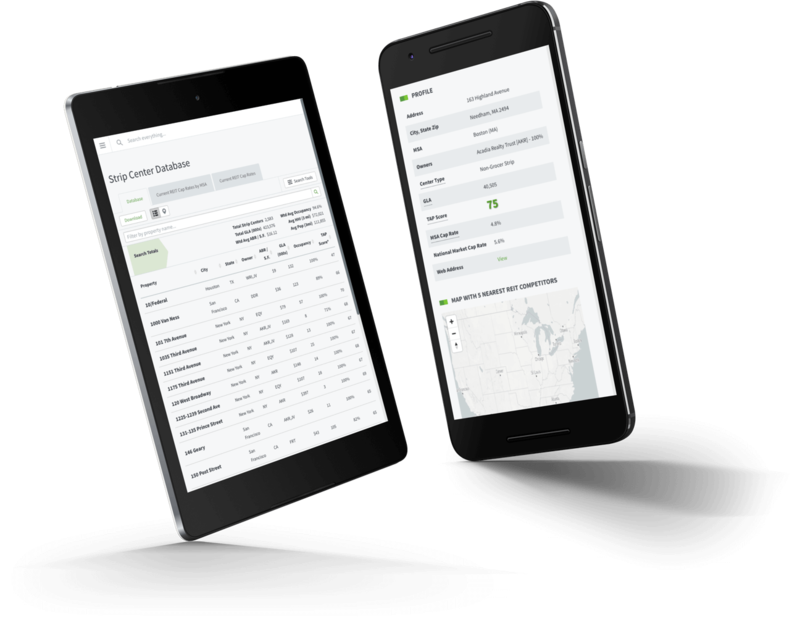 Database users can generate custom reports by REIT owner, market, tenant, and strip center property type, download up-to-date competitive profiles; and map property locations for assessing a property’s quality and outlook. Company Comparisons offers a variety of side-by-side and graphical comparisons of key valuation metrics, including cap rates, implied cap rate spreads, and observed premiums/discounts to gross asset value. 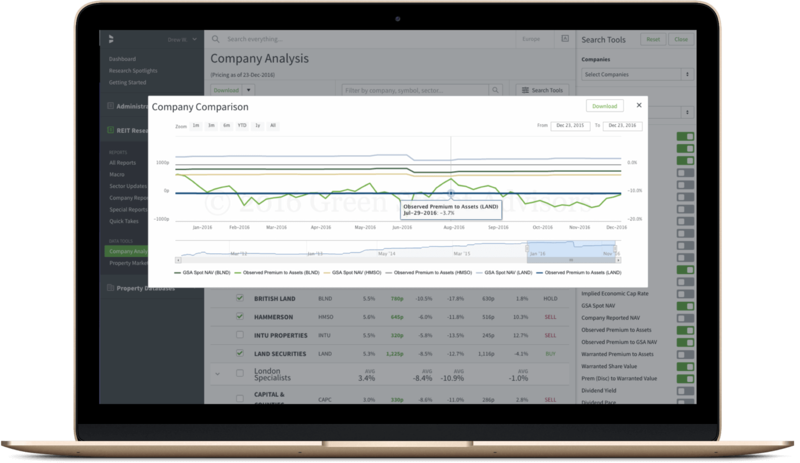 Investors can customize the tool to help uncover investment opportunities by revealing meaningful pricing discrepancies across companies. Green Street’s Commercial Property Price Index is a monthly time series of unleveraged U.S. commercial property values that captures the prices at which commercial real estate transactions are currently being negotiated and contracted. Features that differentiate this index are its timeliness, its emphasis on high-quality properties, and its ability to capture changes in the aggregate value of the commercial property sector. Live corporate governance scores based on 10 key variables from our Corporate Governance Model, including board make-up, anti-takeover devices, potential conflicts of interest, and past actions. Charts compare results to those of sector and industry peers. We also provide compensation data and analysis for each company in our coverage universe, with graphs comparing results to sector peers and industry averages. These charts assess the appropriateness of pay packages, given adjustments for size and returns. The REITrader is designed to spot pricing anomalies that sometimes arise in markets. Based on the premise that the pricing of companies owning similar property portfolios should be tightly linked, it generates a signal when those linkages break down. A “cheap” / “expensive” REIT is one where the current implied cap rate, relative to that of its peers, is unusually high/low relative to historic norms. 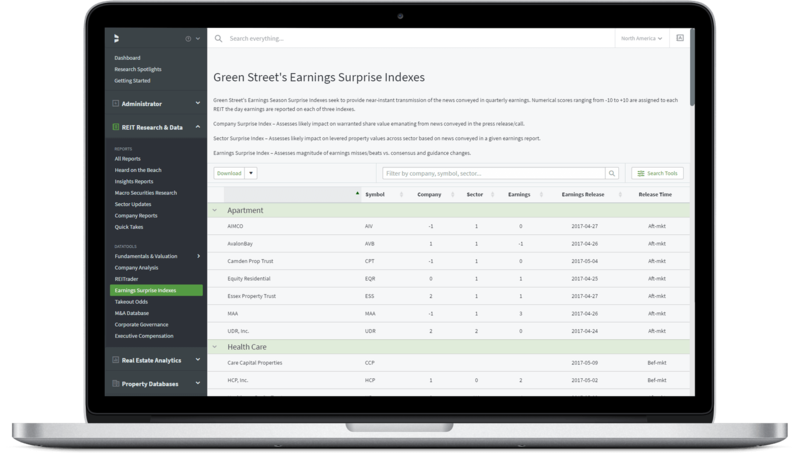 Green Street's Earnings Season Surprise Indices seek to provide near-instant transmission of the news conveyed in quarterly earnings. Numerical scores ranging from -10 to +10 are assigned to each REIT the day earnings are reported on each of three indices. Company Surprise Index – Assesses likely impact on warranted share value emanating from news conveyed in the press release/call. Sector Surprise Index – Assesses likely impact on levered property values across sector based on news conveyed in a given earnings report. Earnings Surprise Index – Assesses magnitude of earnings misses/beats vs. consensus and guidance changes. Certain traits have long been associated with outperformance by REITs. 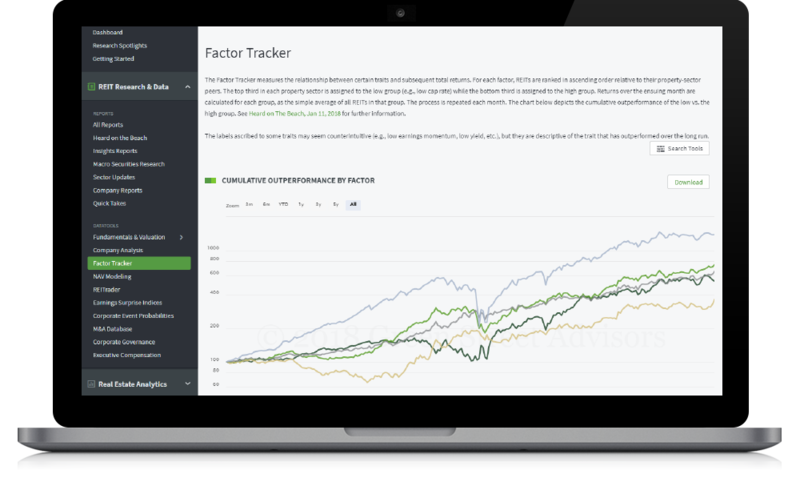 Our Factor Tracker affords the ability to measure the relationship between 15 different factors and subsequent total returns. Reverse momentum, low cap rates, low leverage, small size, and low dividend yield are factors that have been strongly associated with excess returns. 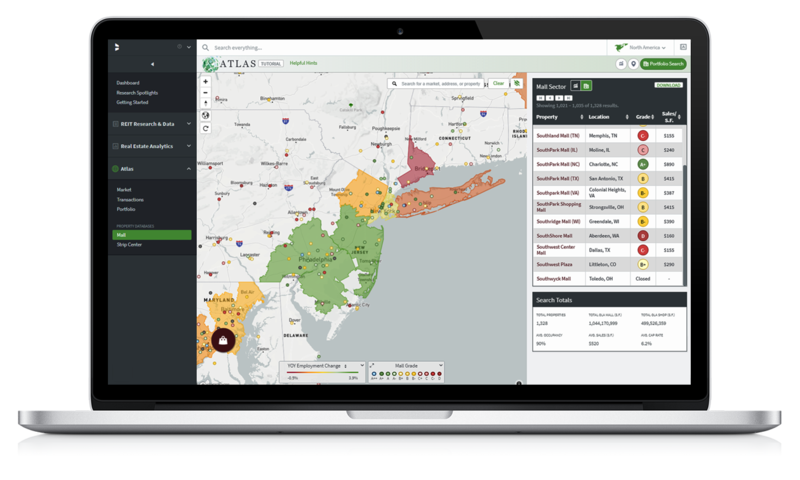 The new Portfolio Search tool allows users to easily explore and analyze REIT portfolios through Atlas, an interactive mapping and analytics platform. Access proprietary REIT portfolio grades, cap rates, square footage for more than 10,000 REIT-owned property locations across seven sectors. Individual listed company profiles illuminate the critical factors behind Green Street’s valuations and investment recommendations. Includes proprietary metrics across companies, sectors, markets and countries in our coverage universe. The Net Asset Value (NAV) modelling tool provides an in-depth look at the components of our NAV estimate for each REIT—the first building block in Green Street’s core valuation model. Clients can incorporate their own assumptions and test sensitivity to the assumptions employed by our analysts. Company Comparisons offers a variety of side-by-side and graphical comparisons of key valuation metrics, including Net Initial Yields, Implied Net Initial Yields, and observed premiums/discounts to gross asset value. 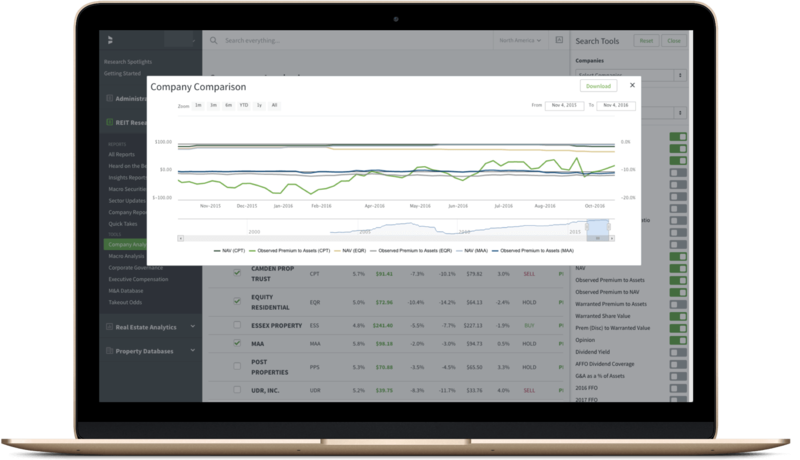 Investors can customise the tool to help uncover investment opportunities by revealing meaningful pricing discrepancies across companies. This tool uses interactive, downloadable graphs and data for analyzing Pan-European real estate. It provides clients with historical data and benchmarks to understand valuations, the relative attractiveness of the listed and direct markets, and other pricing indicators. Green Street’s Pan-European Shopping Centre database covers over 500 retail properties with an estimated spot value well above €100bn across 16 countries. The database offers proprietary valuation measures and quality grades, custom reporting and property mapping. Our coverage universe includes 121 REITs and other publicly traded real estate companies, including 79 companies in North America and 42 in Europe. We offer sound investment conclusions and expert investment advice on REIT and real estate companies across 14 sectors and 75 markets. SRC Spirit Realty Capital Inc.
A trusted source of REIT research, providing respected and unbiased third-party analysis for more than 30 years. A differentiated perspective on both direct real estate investment and public REIT markets. 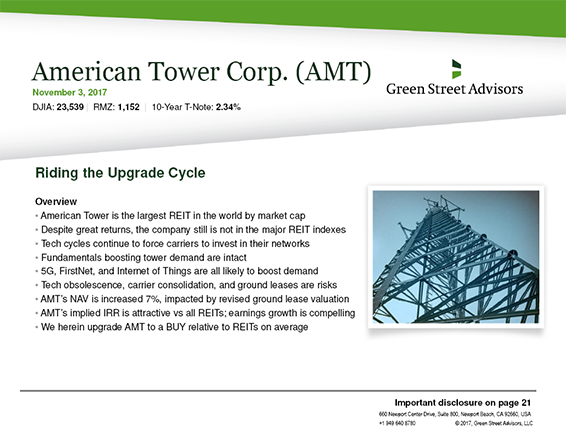 A proven ability to boldly and accurately forecast relative REIT stock performance and the direction of changes in real estate values. An experienced analyst team providing views on the global economy, comparisons across real estate sectors and coverage of individual REITs. An ability to distill vast amounts of data into usable intelligence and deliver it via digestible reports and data tools.